This volume is a selection of the early work of the British poet John Wilkinson, whose work took its cue from J. H. Prynne–who, many would argue, is the most important living English poet. 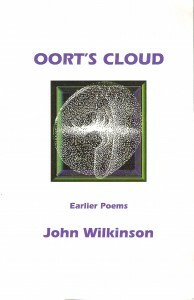 Wilkinson is perhaps the most distinguished poet of the post-Prynne generation: what this volume shows is that the influence of Prynne, and of American poets like John Wieners, has never been an overwhelming one for Wilkinson: even the earliest poems collected here are startlingly assured. (In fact, it’s the recent Wilkinson–in volumes like Sarn Helen and Flung Clear–that has seemed most directly Prynnean. For instance, much of Oort’s Cloud can be read without the help of a dictionary.) The poems seem wired: despite their restlessness & disjunctiveness, their confusion gives a good sense of what it must have been to be young & bright & stylish in the 1970s: you can almost hear the punk & reggae soundtrack to some of the poems. The significance of this book is partly that it reconstructs so many projects that never saw print: after the opening selections from published books like Aquamarine, The Central Line & Useful Reforms, we get samples of quite a lot of projects which remained scattered in periodicals, like Air Fleet Base and Sweet Balsam Leaves. It’s a pity that the terrific Tracts of the Country is only represented by one (long) section; & that Swarf: a prophecy is omitted (an ominous poem from the first year of Margaret Thatcher’s reign: the cover of the original edition shows an assemblage of razorblades). But this is an invaluable book–anyone interested in the experimental end of contemporary poetry will want it. Ripped from surveillance: a last line from a first book now a quarter-century old marks out the pathway of disinheritance which English poet John Wilkinson has blazed ever since. Here that first, final look takes us past Useful Reforms and on, through Prior to Passage to Sweetness and Light, backslicing many others both included and absent, from Maudie’s Umbrella to Ondine’s Curse, dispersed to the outer/inner band of Oort’s Cloud in a kaiserschnitt of sovereign dismemberment. Published by Subpress and Barque Books.